I have just finished browsing the winners for the 2013 World Press Photo Competition. I was blown away with the quality of the images, and the ability of these amazing photographers to put themselves in a position to capture them. The ability to put themselves in a situation like this, and still be able to focus on anything at all, let alone all the technical attributes that go into taking the photo is quite simply amazing. 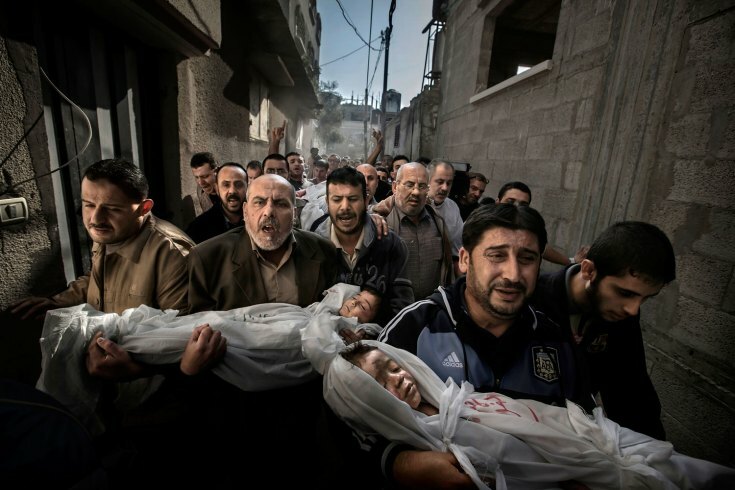 The overall winner of the 56th World Press Photo Contest is Swedish photographer Paul Hansen for his image from Gaza. The photo shows the bodies of two children being carried by family members to their funeral. After looking at the collection of images that had won, and placed highly in the competition, I started feeling a bit depressed. This is the world that we live in. The most important, captivating and award winning press photos for the year are of death & sadness. Is this really what people are wanting to read about and look at? I understand that this is reality, and unfortunately these things are happening throughout our world. But would our world be a better and happier place if the images we are seeing everyday on line, in our newspapers and on our television were images of hope, success and beauty? Being a photographer, I tried putting myself in the shoes of Paul Hansen, the photographer of that winning image. How would I feel having taken that photo? How would I feel winning such a prestigious award for taking that photo? Is it really a winning photo when it depicts such strong emotions of human suffering? “The strength of the picture lies in the way it contrasts the anger and sorrow of the adults with the innocence of the children. It’s a picture I will not forget.” – Mayu Mohanna, Jury member from Peru. As a press photo, I guess this is what its all about. Creating an image that is not forgotten by someone wading through the thousands of images a day that we all come across in this media rich world we live in. The telling of the story is important. And hopefully, in some way, can help make a change in the situation in Gaza. Will it make people stand up and take notice? Will it change the way people think, act and respond to this ongoing conflict? Will it cause us, as humans, to demand a change, to demand our leaders and politicians step in and do what ever it takes to make things better? All to often I think we take these sort of images for granted. Sure the photographer chooses to go and can leave when they want. But I still can’t help thinking about the emotional impact that a job like this has on a person. You’re a photographer, you have a camera, how can you help people in some of the worst situations mankind has ever created for itself? Child trying to reach a feeding center, Sudan 1993. 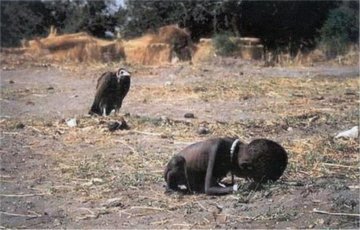 Photographer: Kevin Carter. The newsworthy and important images that we see, that show us what is happening in our world, that are used to sell newspapers, magazines and TV ratings are captured at such a high cost. Costly to the people in them, and to the people taking them. Perhaps we will take a little bit longer, and even say a short prayer, when we look at the front page of this mornings newspaper and think about the people in the photo and the people taking it. 1st Prize General News: Aida cries as she recovers from severe injuries sustained during a Syrian military bombardment of her home, in the northern city of Idlib. Her husband and two children were killed in the attack. Photographer: Rodrigo Abd. 1st Prize Contemporary Issues: A woman sits on bags of waste she has salvaged, at the Dandora municipal dump, outside Nairobi, Kenya. Photographer:Micah Albert. Previous Post Ancient Monasteries of Armenia – A Black & White Collection. Next Post Starting out . . . .